When Kimberly Richardson lost her husband in 2003, it could have been the end of her life. She was isolated and depressed, and very much in denial about what had happened. The love of her life and father to her child was killed unexpectedly in a car crash on Oct. 17 when he was just 27. At age 24 and with a 6-year-old son, life had turned upside down. After five years of denial and anger, Richardson came through her ordeal and founded Widows of Opportunity. 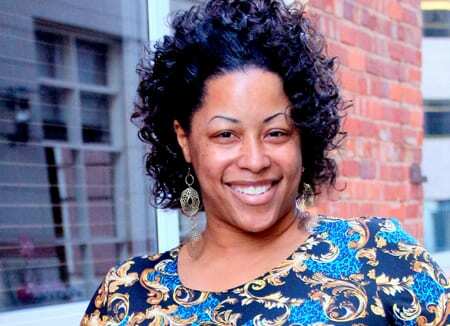 The nonprofit organization was created out of her own personal experiences with dealing with life as a widow. Richardson said that while family and friends initially surrounded her in the days and weeks after the incident, she did not have the consistent support that she desired. Richardson wanted to make sure women who had just lost their spouses could access an outlet to deal with their grief as well as be around a community of women that have shared experiences. Today Kim continues her ministry with Widows of Opportunity and offers personal videos every week on her Facebook page called “Widows of Opportunity”. She also has a website that offers grief tips, motivational videos, testimonials as well as a 6 week grief course that can be done via Skype. Kim is also a motivational speaker and grief specialist. What I especially love about Kim is that she is REAL. Her love and care for widows comes across so strongly in her weekly videos on Facebook and they always end with her beautiful smile and wave that makes you feel that you have been in a one-on-one conversation with her. If you have never gone for grief counseling or done any kind of grief work, seriously consider signing up for Kim’s 6 week grief course. Grief work with help is a must and this is a great way to start. One thing that I find very affirming and healing is to read books written by Christian widows and some widowers. To this date I have read over fifty and have found that there are several books that are my top three. One such book is a new one called Fighting Forward written by a remarried widow Jan Owen from Alabama. For those widows who find themselves struggling greatly with their shattered faith, people who have lost a loved one or someone who wants to understand the grief that their friend is going through, this book is a must read. Jan’s story sharing what life has felt like to her after the loss of her husband is one that is very raw. She chooses not to sugar-coat her words in order to just be real. There are those Christian widows who may not feel that they can ever take off their mask during grief thus giving others the impression that they are doing alright. Jan rips off her mask and allows herself to become openly vulnerable. As a result, she lost some friends. Her intent in writing this book is to let others know that it is okay to share your grief in totality from the deepest parts of your heart. In fact, it’s very healing. After all, God created us and knows exactly how we are going to react when we lose our spouse. You cannot hide all that your are feeling from Him. As my Christian psychologist Dr. Dan Trathen always told me, “This is not God’s first rodeo.” God is not surprised or taken aback at our rage or anger towards Him. Our questions don’t cause Him to be disappointed in Him. Instead, He uses those questions to draw us into a much different and much closer relationship to Him if we allow it. “Choosing to live when I’d rather not is the bravest thing I’ve ever done”, says Jan. When my husband first died, I wanted to curl up in a corner with a blanket over my head and never move again. Closing down is always an option for a new widow or even one further down the road, but it is never a healthy one. It’s far harder to stand up, take that blanket off our head, put on your boxing gloves and begin to purposely take one step forward at a time. There are times when we’ll find ourselves taking a few steps backwards and that is normal. Those backward steps come when a grief trigger hits or when we just become so very tired in our journey that a rest stop is needed. The key is to never stay in that backward spot. It takes more guts to fight forward and God gives us the strength to do that. God can and will use that deep, deep soul pain that you go through after the loss of your spouse. Whether it is to walk alongside another widow and encourage them in their journey, gathering names of new widows throughout the year and then sending each of them a special box for Christmas, sending out widow resources to new widows that you hear about or going to grad school to become a grief counseling specialist such as Jan is doing, your grief will not be without a purpose. Have you chosen to fight forward? Or are you still lying on the mat struggling? No matter what your answer is, this book is one that will help you and allow you to know that you are not alone. Don’t be afraid to fight forward! 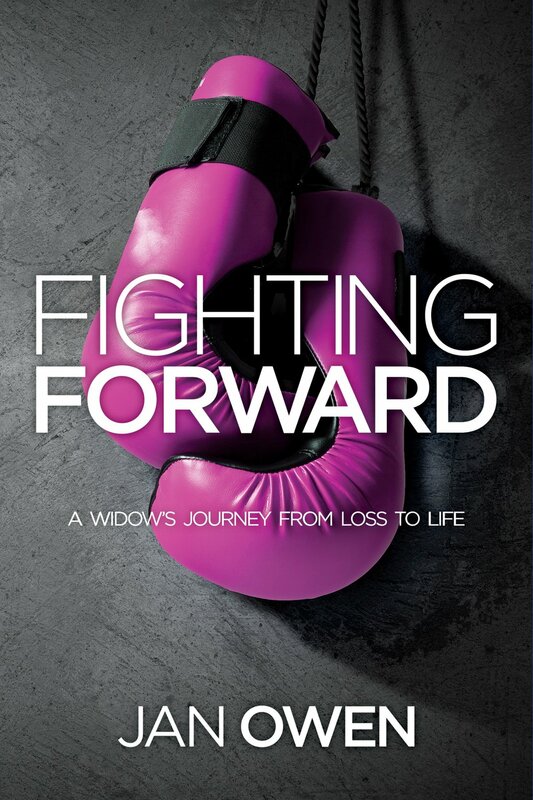 You can find more information about Jan and her book on her Facebook page called Fighting Forward.